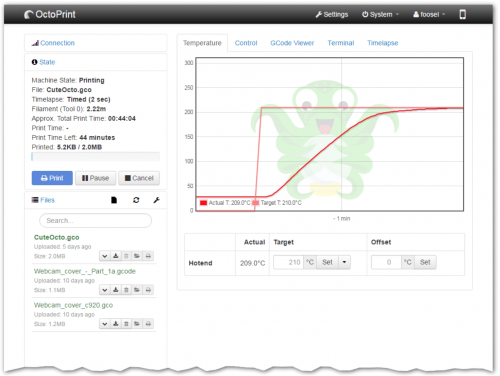 Control and monitor your 3D printer remotely with a Raspberry Pi and OctoPrint. Whether you have a 3D printer at home or use one at your school or local makerspace, it’s fair to assume you’ve had a failed print or two in your time. Filament knotting or running out, your print peeling away from the print bed — these are common issues for all 3D printing enthusiasts, and they can be costly if they’re discovered too late. 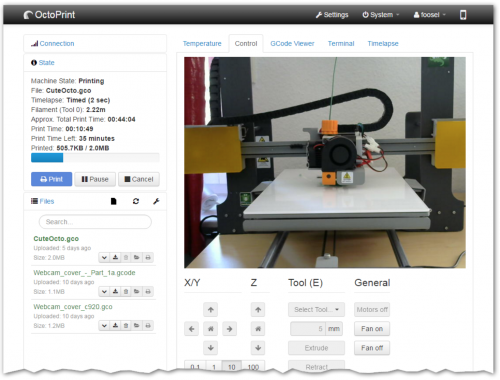 OctoPrint is a free open-source software, created and maintained by Gina Häußge, that performs a multitude of useful 3D printing–related tasks, including remote control of your printer, live video, and data collection. To control the print process, use OctoPrint on a Raspberry Pi connected to your 3D printer. First, ensure a safe uninterrupted run by using the software to restrict who can access the printer. Then, before starting your print, use the web app to work on your STL file. The app also allows you to reposition the print head at any time, as well as pause or stop printing if needed. Since OctoPrint can stream video of your print as it happens, you can watch out for any faults that may require you to abort and restart. Proud of your print? Record the entire process from start to finish and upload the time-lapse video to your favourite social media platform. Octoprint records real-time data, such as the temperature, giving you another way to monitor your print to ensure a smooth, uninterrupted process. Moreover, the records will help with troubleshooting if there is a problem. OK, you can print anything you like. However, this design definitely caught our eye this week. This is a Timelapse of my biggest print project so far on my own designed/built printer. It’s 500x170x700(mm) and weights 3 Kilograms of Filament. You can support the work of Gina and OctoPrint by visiting her Patreon account and following OctoPrint on Twitter, Facebook, or G+. And if you’ve set up a Raspberry Pi to run OctoPrint, or you’ve created some cool Pi-inspired 3D prints, make sure to share them with us on our own social media channels. OctoPrint and a Raspberry Pi work wonderfully as a 3D printer controller. I wonder how I got by before I started using it. I’m using Repetier Server on the Pi and it works rather well. The printer is attached to the Pi via USB and I connect to the Pi via my workstation over WiFi. The only nut I have left to crack is if I don’t print anything for a few days, my workstation cannot find the Pi unless I “wake it up” – go load a web page or ping a DNS server or something. I do not think that has anything to do with Repetier (Host or Server), as I can’t ping it either. Otherwise, it’s been extremely reliable. In any case, using a Raspberry Pi as the front end to your 3D printer is definitely the way to go. Is your Pi a Pi3? Running wifi? If so, this might be still valid – it was a problem for me on Jessie. Is Octoprint a software? Does it run on Pi beta as well? OctoPrint and a Raspberry Pi are fabulous workings 3D printer I am user for almost a year now. To use octopi, do I need to be on the local network with the Pi/Printer, or can I remotely print from anywhere?